Santa Clara, CA, and Paris, France, August 23, 2017 – 6WIND, a high-performance networking software company, today announced a replacement program for customers seeking an alternative to Brocade’s vRouter, which is now end-of-sale and approaching end-of-support. 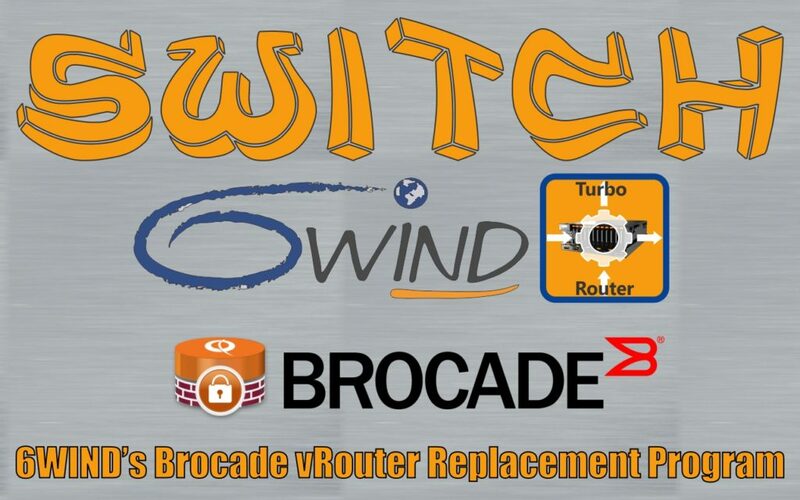 Effective immediately, 6WIND Turbo Router™ software is available to support Brocade vRouter customers. 6WIND Turbo Router is a high performance, ready-to-use software network appliance, to be deployed in bare metal environments or as a virtual machine running on commercial-off-the-shelf (COTS) servers. It includes routing and firewall features with an additional 6WIND Turbo IPsec™ option to create IPsec VPNs. Based on DPDK (Data Plane Development Kit) for performance, 6WIND Turbo Router separates its full featured data plane and control plane for customer use case flexibility. Management options include CLI, XML or Linux-based tools. Performance: 12 Mpps per core, standard 1/10/40/100GE NIC support and scaling up to 1 million routes. All Layer 2, IP forwarding, virtual routing, Layer 3 and security processing features run in a fast path architecture outside of the Linux kernel to avoid bottlenecks. Price and Support: Significant incentives for direct Brocade replacements, including options for subscription and perpetual licenses. Licenses are priced per performance from 2G to 100G.